Cyberpunk science fiction emerged in a decade that saw an unprecedented ascendency of visual and virtual media in popular culture. Within the expansive mediascape of the 1980s and 1990s, cyberpunk’s aesthetics took firm root, relying heavily on visual motifs for its near-future splendor saturated in media technologies, both real and fictitious, such as video games, music videos, computer-generated worlds, augmented realities, consensual hallucinations, data networks, and many other technologies. As today’s realities look increasingly like the futures forecast in science fiction, cyberpunk speaks to our contemporary moment and as a cultural formation dominates our 21st century techno-digital landscapes. The 15 essays gathered into Cyberpunk and Visual Culture engage the social and cultural changes that define our cyberpunk moment(s) and address the visual language and aesthetic repertoire of cyberpunk – from cybernetic organisms to light, energy, and data flows, from video screens to cityscapes, from the vibrant energy of today’s video games to the visual hues of comic book panels, and more. Unlike other anthologies that limit their analytical apparatus to literary cyberpunk, the essays of Cyberpunk and Visual Culture provide critical analysis, close readings, and aesthetic interpretations of exactly those visual elements that define cyberpunk today, moving beyond the limitations of merely printed text to also focus on the meaningfulness of images, forms, and compositions that are the heart and lifeblood of cyberpunk graphic novels, films, television shows, and video games. Graham J. Murphy – Cyberpunk Urbanism and Subnatural Bugs in BOOM! Studios’ Do Androids Dream of Electric Sheep? Since its inception, cyberpunk has been haunted by the notion that it represents only a very brief moment of the science fictional imagination, a moment which quickly passed. Murphy and Schmeink’s smart collection proves the opposite is true: cyberpunk never ended, and in fact its vast transmedia landscape of images, icons, visual artifacts, and technological apparatuses has completely taken over our world. The report of cyberpunk’s death was an exaggeration, clearly, as the essays in this vibrant collection demonstrate. The ambiguities, complexities and excitements of this intermedial genre are explored here in riveting detail: the legacy of Gibson’s ‘lines of light’ are demonstrated to be, indeed, unthinkably complex. 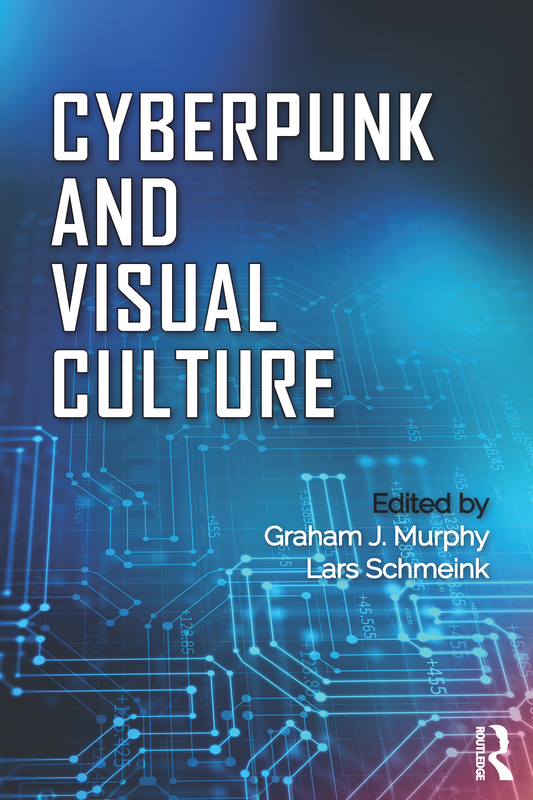 In addition to offering the fullest documentation to date of the range of visual media infiltrated by and responsive to the cyberpunk aesthetic, this collection offers bold new arguments about the relation between print and visual narratives and the convergent, cross-media character of contemporary science fiction in general. The book will be available in both paperback and hardcover. To preorder the book, go to the publisher’s website or visit Amazon.